Illustration: Pat Dolan. Earth Cells. 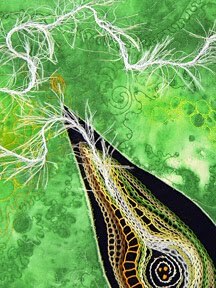 The organically inspired textile artwork of Pat Dolan can be viewed as both a reflection of the macro or micro cosmos that we live both with and inside. Dolan in fact shows us a world that we cannot see with our own eyes and very often find hard to perceive. It is a world of building blocks, an organically derived series of balances and relationships between near likenesses and complete opposites. This tension between opposite and similitude would seem to be a recipe for constant tension within the natural world, but this complex series of relationships creates an organism that gains strength through the variety of opposites, negatives and similarity groupings. Illustration: Pat Dolan. Earth Cells (detail). This complex relationship is cleverly highlighted by Dolan in her work. She often uses very close juxtapositions; in fact a series of strained partnerships would be a closer analogy, between the light and the dark, the soft and the hard and the smooth and the rough. By building up a variety of textural layering she highlights the strange but often fruitful harmony that can be created from a complex mixture of textures, colour tones and scale. Illustration: Pat Dolan. Going in Circles. 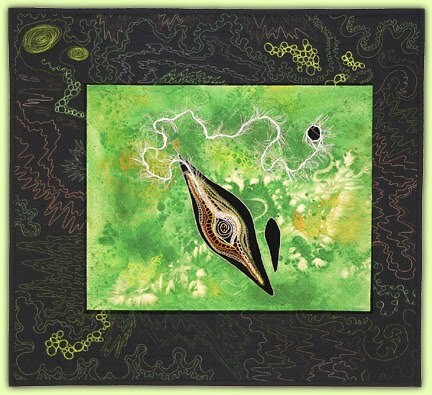 Without viewing the titles of Dolans' compositions, and therefore having foreknowledge of their narrative, we are unaware of whether we are viewing a blood cell or a galaxy, in other words the micro or the macro world. This is indeed as it should be, as the two seem indistinguishable to the human eye and mind, apart from scale. Both seem to use the same building blocks of strained and compatible relationships and Dolan through her compositions shows us that the relationship of harmony that she wishes to highlight for us is very nearly a universal norm. Illustration: Pat Dolan. Black & White Cells. Dolan's work is both intriguing and satisfying. She shows us a complex multi faceted world that is full of contradictions, juxtapositions and uncomfortable relationships between opposites, but she also shows us a world that works well and that is the stronger because of the complexity of textures that goes to make up its structure. This template of complex but ultimately successful series of relationships that goes into making up the building blocks of life can be seen as an analogy of our own lives and our complexity when dealing with those around us. Whether we deal successfully with our lives and those of others seems to depend on whether we deal with the juxtapositions that life throws at us, in a harmonious way or not. Illustration: Pat Dolan. Gone to Seed. 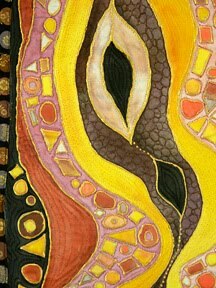 Pat Dolan trained as a fine artist and discovered the potential liberation of textile art and never looked back. Her work has been highlighted in a number of publications and she has exhibited across the US. She has her own comprehensive website where more of her work can be viewed. Her website can be found here. She also has a regularly updated blog which can be found here. Illustration: Pat Dolan. Gone to Seed (detail). All illustrations were used with the kind permission of the artist. I'm privileged to know Pat personally, and she is as fine a human being as she is an artist. I really enjoyed your review of her work and your observations; I can only add that it is even more wonderful when viewed up in person, to better appreciate the textures and details. I love her work and your site! 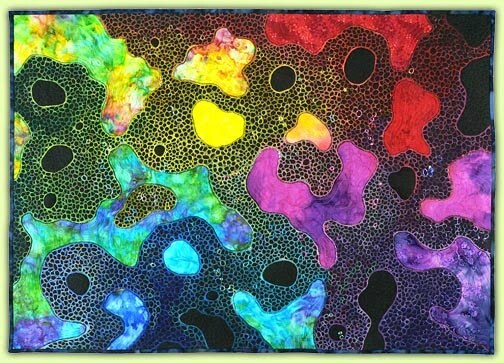 Textiles often inspire my paintings! All the best in the year ahead! Thank you for your comments and glad that you enjoyed the article on the work of Pat Dolan. 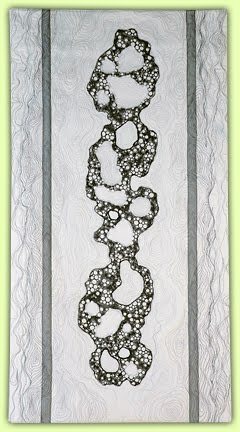 The next textile artist to be featured on The Textile Blog will be Denise Livet. While I thanked you privately for the wonderful write-up you have done on my work, I did not thank you publically here on The Textile Blog. It has been an honor to be one of your featured artists! And you offered some interesting insights into my work that others often miss. It was my pleasure Pat. It was indeed a great pleasure to be able to write about such intriguing and individual artwork.